Exercising after an angioplasty may seem counter-intuitive. My first thought was to conserve as much energy as possible so as not to strain my heart and my circulatory system. My doctor had other ideas and I completed a six-week physical rehab program to get over the fear that exercising would kill me, literally. At my one-year post-surgery checkup, my doctor encouraged me to continue exercising regularly, even saying it would help me feel less tired. 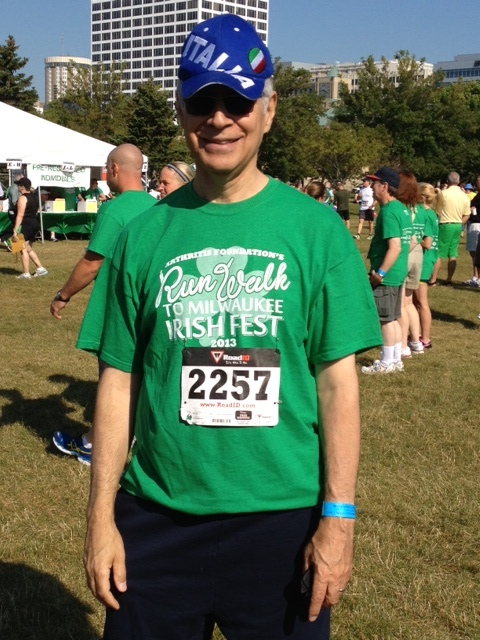 Me preparing for the Irishfest 5K in Milwaukee. I’m Italian-American by birth and Irish-American by education, having attended Irish-run Catholic schools in New York where I learned all the Irish songs and had St. Patrick’s Day off as a holiday. So recently, I went ahead with plans to walk a 5K with my wife and friends in Milwaukee, the city where I went to undergrad school and so where I still feel most like a teenager, as silly as that might sound. In 2009, I had run the same 5K as part of my then fitness regime. It was my second of two 5K runs that year. Now, quite frankly, I am afraid to run that distance, fearing it will over-tax my arteries and heart. So I walked instead. By the second mile marker, I was feeling shaky, sure I would pass out any second. But I’ve been living with such fear for a year, so I kept walking. I’d also asked my doctor how I would know if an artery was clogged again and he told me simply to remember what the chest pain had been like for me last year. If I felt that pain again, it would be happening again. I did not feel that pain during my 5K, and so I continued walking and finished along with the rest of my team. Aside from some leg soreness the next day, I felt fine. And also felt maybe a little less afraid to exercise. Why write about this on a food blog? Because if you’re on a restricted diet, it’s for health reasons, reasons which also may be impacting how you think about exercise. Talk to your doctor and, if need be, talk to a shrink as well to face your fears and know what truly to fear and what to chalk up to natural reticence to put yourself in harm’s way.